April was special even among the best of those days when we had at least two missions in town along with Dr. George and Susie Stavros’ volunteer medical clinic that has been providing a variety of free services to the neighborhood needy on a monthly or more frequent basis for many years. You can read about their incredible deeds elsewhere in this month’s newsletter. 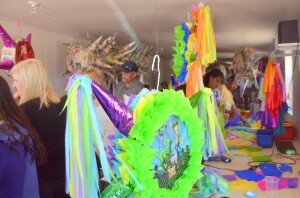 Both of the two missions who came to town the weekend of April 17 had read and were touched by our newsletter article last month about the little non-profit Piñata Factory which is staffed entirely by former students of La Montaña School for children with special needs (read that story at http://www.sonoranresorts.mx/?p=13512) and wanted to make that their first stop on the way in. Hitting town first was a portion of the interdenominational group of missionaries known as Youth With A Mission (YWAM). They arrived bearing donations for The Piñata Factory that included supplies from a list we had included in the article and Ping golf hats for the kids. A van load of what was to later number 26 members from age 6 to 67 from the Mountain View Presbyterian Church in Scottsdale, Arizona arrived shortly afterward. They brought supplies and cash for two new tires badly needed for the Factory’s van that picks up and returns the staff each day. 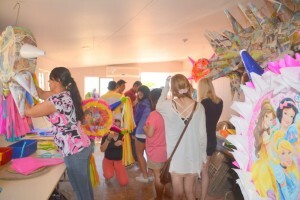 Both groups were delighted to find the factory was exploding in colorful piñatas as they were fulfilling orders for “Día del Niño” (Day of the Child). Those in attendance took advantage of the availability and purchased several. 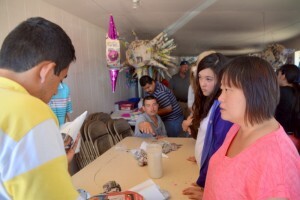 The piñata kids were excited to demonstrate how they make their wares and even gave hands-on lessons on how to make these historic party favors. -Repaired roofing at Pastor Edgar’s Good Samaritan Church in Barrio San Rafael. -Interacted with the children’s ministry at 2 churches, including songs, games and crafts. 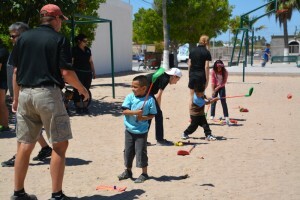 -Performed cooking, crafts and games at the Amores de Peñasco Children’s Crisis Shelter. -Brought the shelter kids to Las Palomas for swimming, banana boating, horseback riding. Included a piñata! -At La Montaña Special Needs School, sanded and painted playground equipment; dug, weeded and planted flowers. -Shared love with special needs kids through games, tattoos and piñatas. -Painted the house of their friend Lupita. -Toured the orphanage in Sonoyta and the Piñata Factory to meet everyone and determine how they might provide support on a continuing basis. -Gave donations to every group they contacted with Bibles, clothes, cleaning supplies, personal hygiene items, paint and painting supplies, a tire, baseballs, Legos and more. 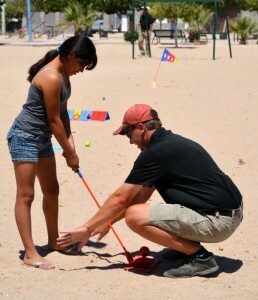 Youth With A Mission came to town for two weeks with the goal of conducting golf clinics for the children of San Rafael Barrio and one school. 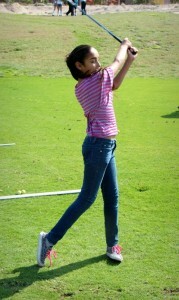 The clinics were hosted by real professional golfers who are also great caring teachers. They are experienced in carrying the Word—and a golf bag—to clinics they hold around the world. In fact, they had just recently been to Czechoslovakia for an extended mission that included golf clinics. The YWAM mission stayed at the new Peñasco Mission Center, a Missionary Training Center located on two hectares just north of town; a beautiful, serene sanctuary of God whose vision it is to train missionaries in cross-cultural ministries and customs. The Center not only fills a missionary training need, it fulfills the vision of Pastor Stan and Becky Tedrow who founded and built the Peñasco Christian Fellowship Church downtown and later founded the 2 Fish Ministry which began with two bags of beans in 2009 and now serves 2,000 meals a week, feeding, inspiring and serving the hungry and entirely staffed by volunteers. 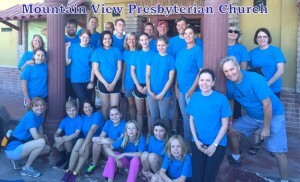 Under the dedicated care of David and Cheryll Medina, the Peñasco Mission Center has hosted missions from many parts of the world. If your church or mission is interested in becoming a part of this growing, ongoing project of God, please visit www.penascomissions.com. The YWAM mission proved to be an energetic bunch who used their energy to get an early start into the barrios on their first morning in town, commandeering part of a public park and gathering any kid who passed by for a lesson in how to swing a club. There were some surprisingly rapid results produced by the skilled professionals using toy clubs and tennis balls, but still amazing to watch five and six year olds correctly connect with the ball for a ten or twenty yard drive as they followed the instructions of their teacher! The smiles were priceless! With the welcoming hospitality of Las Palomas Golf Pro Luis Torres, YWAM held clinics all week with the kids and a few teachers from Escuela #27, Gilberto Pacheco Castillo, Porfinio García Flores, Director. Mark and Barb Olszewski, founders of the non-profit Adopt-a-Classroom organization over 13 years ago, introduced the mission to Escuela #27 as it is one of their original Adopt-a-Classroom schools. As the smiles in these photos taken by Alisa Hoodikoff (YWAM) and Mark Olszewski indicate, there was no shortage of fun during these clinics. To top off a great two weeks in Puerto Peñasco, YWAM made formal donations of golf equipment at Escuela #27, joining the local Rotary Club who gave the school five air conditioning units, and another Rotary group from California who donated a variety of sports equipment to the school. The students expressed their gratitude by presenting a special Dia del Niño (Day of the Child) performance! Their last deed was a golf clinic out at Pastor Edgar’s Good Samaritan Church in San Rafael barrio. Yes, April was a month of special charity to remember for a long time. We hope to welcome these missions back to our little slice of paradise by the sea real soon!